While semi truck accidents can be particularly devastating no matter the cause, those that result from driver negligence, such as recklessness, aggression, driving while distracted, and driving under the influence can be even more shocking and upsetting as these incidents are preventable. Violations of these rules typically seem to indicate negligence, and clear evidence of this alleged negligence by a drunken truck driver could strengthen victims’ claims should they decide to seek legal counsel and pursue a claim for compensation. A lower BAC limit is necessary in order to ensure that intoxicated semi truck drivers do not present a danger on the roads. Although any drunk driver can significantly increase the likelihood of an accident, semi trucks are larger and typically more complicated to maneuver, so it is particularly important for semi truck drivers to remain capable, alert, and attentive while traveling. Since studies show that consuming even a small amount of alcohol can impair cognitive function and affect reaction times, the lower BAC limit for semi truck drivers helps to protect the public by ensuring that these drivers think twice before driving while intoxicated. Semi truck accidents caused by DUIs can cause severe, life-threatening complications such as traumatic brain injuries and spinal cord damage. 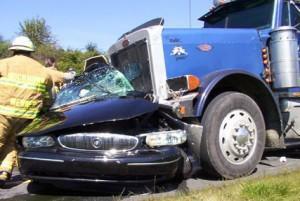 The semi truck driver is likely to sustain injuries, but most commonly, it is the driver of the passenger car that typically receives the greatest injuries. Those who have been injured due to the fault or negligence of another may be entitled to seek compensation from the liable parties to cover medical expenses, psychological effects, pain and suffering, lost wages and more. In semi truck accidents involving drivers who were operating their vehicles while under the influence, the liability may extend beyond the truck driver. An experienced Georgia DUI truck accident attorney may investigate a serious or fatal truck collision involving drinking and driving and find that the driver’s employer was also negligent. The trucking company may have been aware that the driver was intoxicated or failed to properly supervise or train the driver. In such cases, victims may be entitled to file a lawsuit for negligent entrustment of vehicle. Semi truck accidents in which the driver is accused of driving under the influence often lead to complex personal injury claims. Insurance companies for the responsible parties may attempt to quickly settle the case or simply deny the victim’s claim outright. If you or someone you love has sustained injuries in a semi truck collision, it is in your best interest to seek legal counsel from an aggressive Atlanta drunk driving semi crash lawyer who can work to protect your legal rights. Those who have been injured in a semi truck that was caused due to a driver operating the vehicle under the influence of drugs or alcohol may be entitled to file a lawsuit and recover monetary damages for their injuries. Fill out our free, no obligation online contact form, or call Van Sant Law, as soon as possible at (404) 991-5950 to receive a free consultation. We have successfully represented thousands of clients throughout Georgia, and you will not be obligated to pay any of our legal expenses unless we are able to recover compensation for you.